Teaching had been my most consistent career choice. I started playing teacher in first grade. I got a chalk board for Christmas! in 1985. I’d try to teach my siblings. They weren’t interested in that. I’d teach my stuffed animals, but that got boring. I finally found some willing victims, I mean students. I got to teach my grandparents! I’d give them math and spelling tests. I’d even grade their character. They were such good students. Education was our family business. My father, Danny Pettry (senior) had worked for Raleigh County (West Virginia) Board of Education for 40 years, 37 of those years as a principal. His parents were in education too. His father (Posey Board Pettry) was an elementary school principal and his mother (Carrie Pettry) was a teacher. Special education and pre-school education were suggested careers that were best suited on one career test that I had taken in high school. I thought I’d be an art teacher. Education wasn’t the career choice that my parents had in mind for me. Education had changed over the years. I’m not sure how, but I often heard, it is different now. My parents wanted me to go in the medical field. Mom wanted me to be a pharmacist or at least a nurse. I started my undergraduate education at Mountain State University (formerly Beckley College) with intentions of becoming a nurse. I didn’t feel the passion, but I knew it was a guarantee job. Students were required to complete 40 hours of volunteer work in a healthcare setting before they’d be admitted to any degree program. Physical therapy (PT) and occupational therapy (OT) were household names on my maternal side of the family. My cousin Tracy graduated with a degree in physical therapy from West Virginia University in Morgantown. She started working as a Physical Therapist at a Rehabilitation Hospital in Huntington, West Virginia after she graduated. She married Adam, an Occupational therapist. They invited me to stay for a week to do my 40-hours of volunteer week with them at HealthSouth Rehabilitation Hospital (back in 1999). Nursing is a wonderful profession. The nurses at HealthSouth worked hard and took care of patients the way they needed. However, it wasn’t for me. I didn’t feel passion for it. It didn’t make my heart sing. I felt a slight bit of depression imagining a future as a nurse. It wasn’t right for me. Of course, Tracy and Adam, both tried to persuade me to the worlds of PT or OT, respectively. People were laughing in a back room on my second day of volunteer work. This shocked me. Most people were in pain. I thought PT stood for painful things. How could people be having a good time? I decided to go and check it out and I discovered the wonderful world of Recreational Therapy. They offered a mix of recreational therapy interventions to help maintain and promote social, physical, cognitive, and emotional wellbeing as well as quality of life. Wheelchair gardening was provided to allow patients to interact and grow plants. Crafts (like sun-catchers) were provided to allow patients to help regain skills after stroke or other disabling conditions or to help a patient build strength in their non-dominate arm after losing a limb. Relaxation group was provided on the back deck under the trees with music and guided imagery. Fourth of July cookout was provided to help patients to maintain social and to spend quality time with their families. I became the Robin (from Batman and Robin) for the recreational therapy staff for the rest of the week. I assisted with everything, including: transferring patients in wheelchairs to therapy sessions, to getting coffee. I assisted with the cookout. It was great. I felt good about assisting people. I knew I had to do this. I had to become a recreational therapist. Recreational therapy was a lot like teaching. Except recreational therapists aren’t teaching recreation activities for the sake of teaching activities. They teach life skills. Recreational therapists teach people how to function at their highest abilities despite having illness or disabling conditions. Beckley College didn’t offer a degree program in Recreational Therapy. Marshall University in Huntington, West Virginia did. I transferred that next year to Marshall and enrolled in their degree program. I graduated with a Bachelor of Science degree in Therapeutic Recreation from Marshall University in August 2002. I had sent applications and resumes to hospitals to hundreds of hospitals in the Virginias (Virginia and West Virginia) and the Carolinas (North and South Carolina). I felt nervous because I wasn’t getting any responses. One of my cohorts in my undergraduate degree program had completed her internship at a psychiatric hospital in Huntington, West Virginia. She was offered a position providing recreational therapy for children and adolescents for their Psychiatric Residential Treatment Program (PRTF). I felt jealous. She told me she didn’t want it. Recreational therapy just didn’t make her heart sing. She put in a good word for me. The program director at the psychiatric hospital gave me an interview the day after my internship (at the Medical Center) had ended. It felt like a cosmic coincidence. I couldn’t’ hardly believe it. I felt so much happiness and joy that I my dream was coming true. 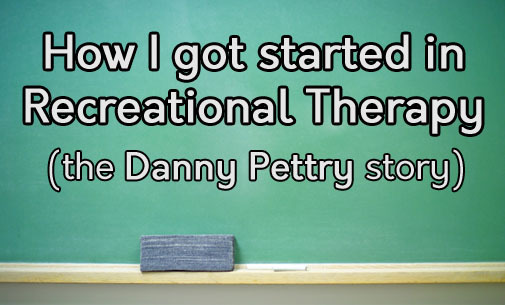 I was going to be a Recreational Therapist (and get paid to do it). I had completed a free 480-hour internship. I started on August 9, 2002. I’ve been at the same psychiatric hospital for 16 years as of August 9, 2018. I have passion for working in the transformation and healing business. As a recreational therapist – I am a teacher. I teach a lot of skills to kids and teens and their families. I teach interpersonal skills needed to get along with others and make friends. I teach emotion regulation skills to help kids manage their own emotions (often through the use of enjoyable activities). I teach problem-solving skills, confidence building skills, positive thinking skills, and so much more. I get to teach these skills through the use of recreational therapies. We go to local parks. The kids play. they learn. they grow. they heal (all in their own time). I couldn’t be happier. I’m living a life worth living. I have a meaningful career. I feel that I’m making a difference. I had the predetermined idea to become a recreational therapist. I decided to do it and I deliberately went and did it, so by Nightingale’s definition, I was a success. Of course, people continue to grow and reach for higher goals in their journey towards self-actualization. While maintaining full-time employment, I’ve earned two advanced graduate degrees, including a Master of Science degree in Recreational Therapy (2006) and a Master of Education degree in Mental Health Counseling (2012), from Indiana University (distant education) and Lindsey Wilson College, respectively. These were pre-determined ideas. I didn’t get those degrees by accident. What makes your heart sing? Are you doing that? If so, great! You’re a success. What are you truly passionate about? Are you living that? If so great! You’re a success. My suggestion: live your dreams because you only have one life to live. Wow – I have a gazillion things to do, but this was an AHA moment. Love it!!!! Love what you’re doing. I pray that we get to meet face to face someday. I work at a Residential Level III facility in Wilson, NC 27893 for male adolescents who start school tomorrow!!! This is my passion. Enuff Said!!!! Love you have an AWESOME Sunday!!!! I love your story and I love your humor and your passion! Yes we are teachers and we awaken souls and hearts and minds (and in my case) the brain! I already know that if we ever meet I will certainly feel honored! !